Russian Banana fingerling potatoes are small in size and are oblong, slender, and crescent in shape, averaging 6-7 centimeters in length. The skin is khaki-colored with many light brown spots freckled across the surface and a few, medium-set eyes. The skin is also waxy, exceptionally smooth, and so thin that it is rarely peeled. The yellow to gold flesh is soft, dense, and moist. When cooked, Russian Banana fingerling potatoes are fluffy and have a full-bodied, buttery, and nutty taste. Russian Banana fingerling potatoes are available year-round, with peak season in the late summer and early fall. 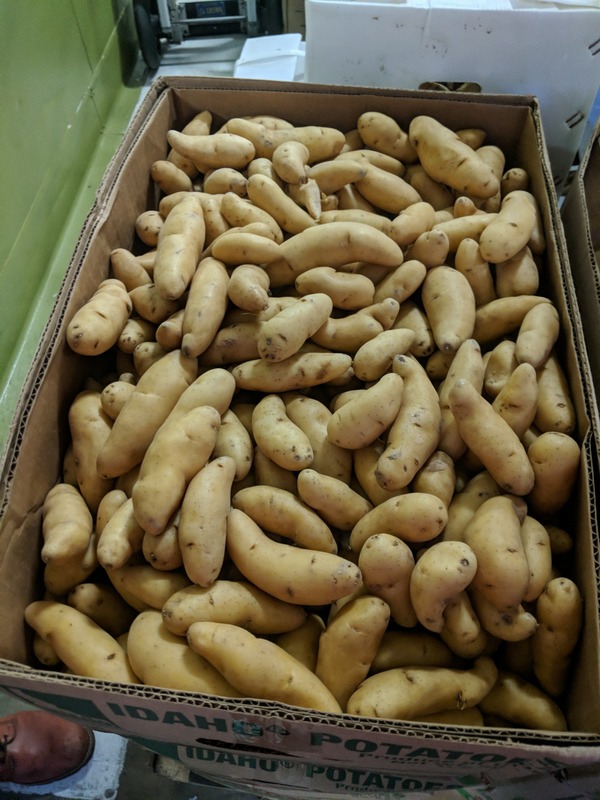 Russian Banana fingerling potatoes, botanically classified as Solanum tuberosum, are members of the Solanaceae or nightshade family along with eggplants, tobacco, and petunias. The tuber’s slight curve and golden color earned the potato its fruity epithet. Russian Banana fingerling potatoes are native to Europe, but today they are the most commonly grown fingerling variety in the United States and are used in a variety of culinary applications. 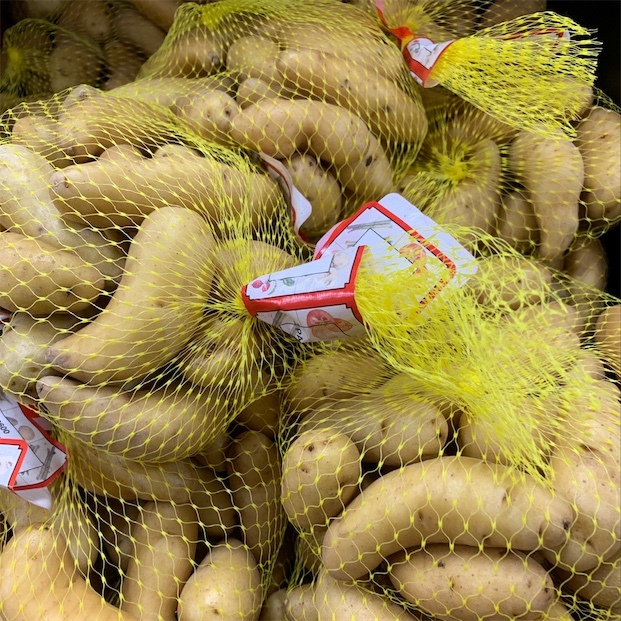 Russian Banana fingerling potatoes are an excellent source of potassium and vitamin C.
Russian Banana fingerling potatoes are best suited for cooked applications such as grilling, baking, steaming, frying, or boiling. They are best known as a salad potato because they hold their shape when cooked and will not fall apart or become mealy. They can also be roasted with herbs and other savory vegetables to create a hearty side dish or cubed and used in soups to create a thick base. Russian Banana fingerlings are also so tender that they have been sliced thin and used as a pizza topping. Russian Banana fingerling potatoes pair well with fresh chives, onions, bacon, mayonnaise, tomatoes, and meat dishes such as ham, brined chicken, and fish. They will keep for 3-5 weeks when stored in a cool, dry, and dark place. Ever since the potato’s 18th-century introduction to the Baltics, it has played a vital role in the region’s cuisine where it is most commonly eaten with pork. In Estonia, varieties such as the Russian Banana fingerling are served in a bean soup with cream or with pork and sauerkraut. Lithuanians serve it with sour cream and herrings, as well as in saltibarsciai, a cold beet soup enjoyed in the summer. The Russian Banana fingerling cultivar was developed in Europe’s Baltic region in the 1700’s. Russian sailors then brought this small potato to North America via the ports of Alaska, the Pacific Northwest, and British Columbia. Once it arrived on the continent, it became highly regarded and an essential staple in North American cuisine. 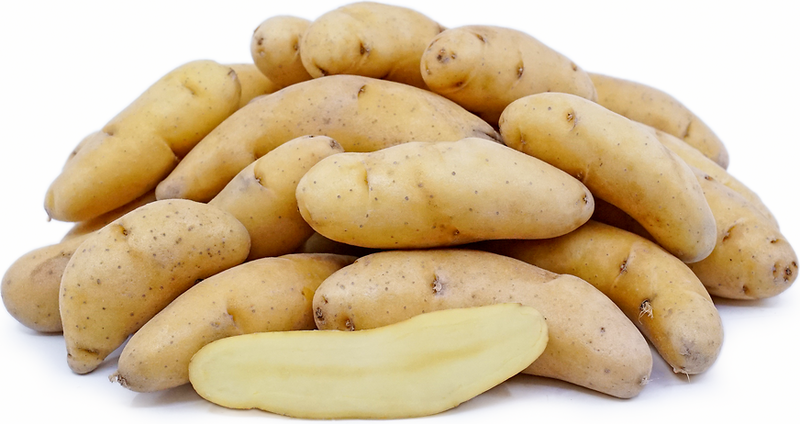 Today Russian Banana fingerling potatoes can be found at grocers and markets across Europe and North America. People have shared Russian Banana Fingerling Potatoes using the Specialty Produce app for iPhone and Android. 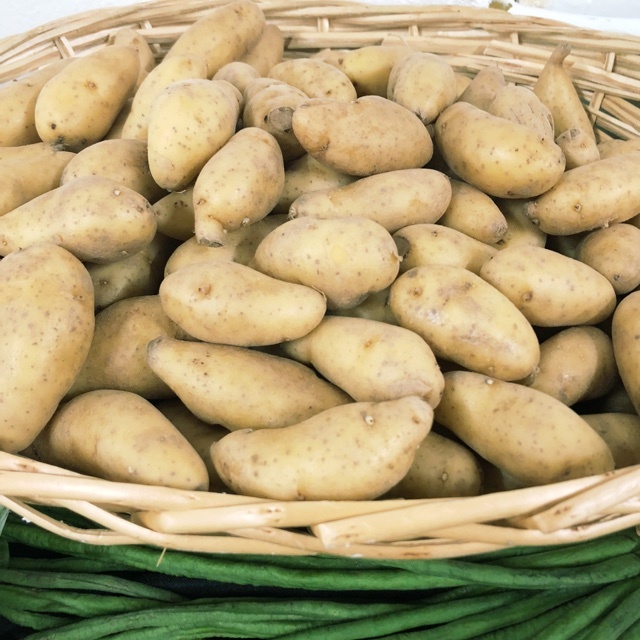 Sharer's comments : Fresh fingerling potatoes ! 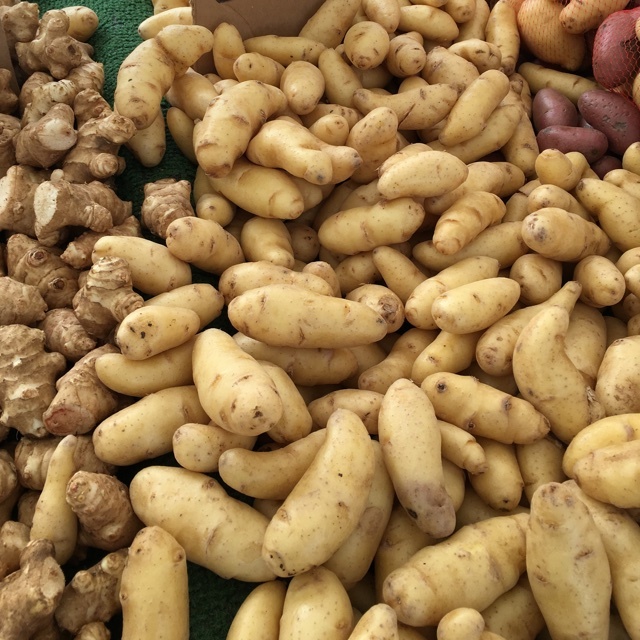 Sharer's comments : Russian Banana Fingerling Potatoes spotted at Virginia Park Farmers Market. Medium sized small potatoes. Great roasted. Sharer's comments : Russian Banana Fingerling Potatoes spotted at Specialty Produce.